I love waffles but who wants to get up and mix all the ingredients and then cook them. 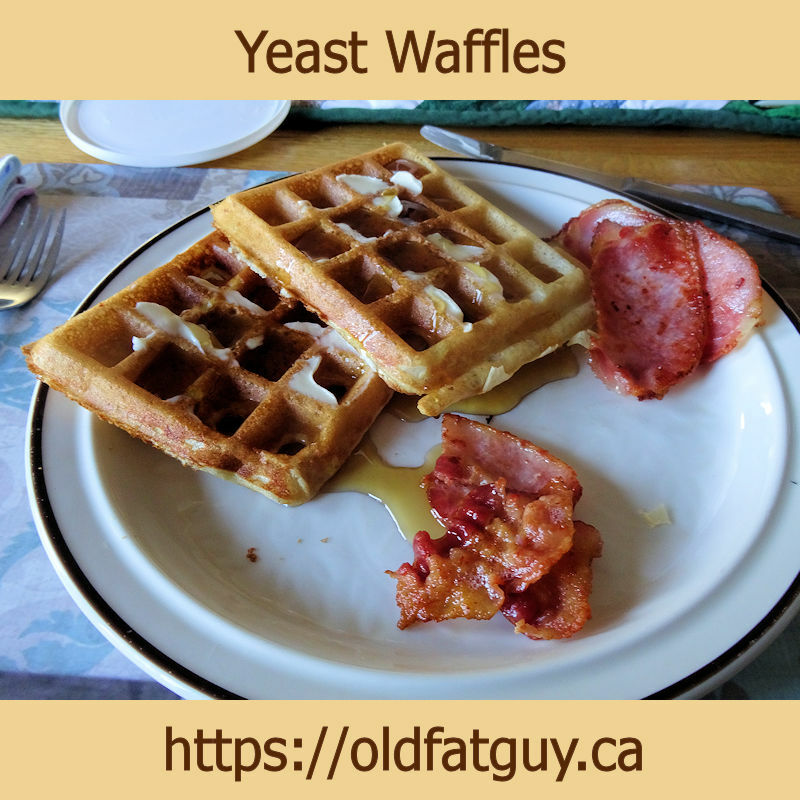 Yeast waffles let you make the batter the night before and you just have to fire up the waffle iron and cook them. The ability to make the batter the night before is particularly handy if you have guests. It gives you more time to visit. I add some whole wheat flour for two reasons. First, it is healthier. Second, I find some whole wheat flour gives a better texture to pancakes and waffles. The lower gluten makes them a bit more tender. However, there is little enough people wouldn’t know there was whole wheat flour unless you told them. You can use all white flour if you’d like but I encourage you to try it with the whole wheat flour. in a microwave safe container. Microwave for a little over a minute until the mixture is quite warm, 120-130 F (50-55 C). Set it aside. Mix the milk mixture into the dry ingredients and stir to combine. Add the egg mixture and stir to make a smooth batter. Cover with a tea towel and let it sit for 20 minutes. Put the batter in the refrigerator for 12 to 24 hours. When you’re ready to cook, the batter will have bubbled up a bit. Stir it back into a batter and cook per the waffle iron’s instructions. In my waffle iron, you put 1/2 cup of batter per waffle section and cook until the steam mostly stops, about 5 minutes. 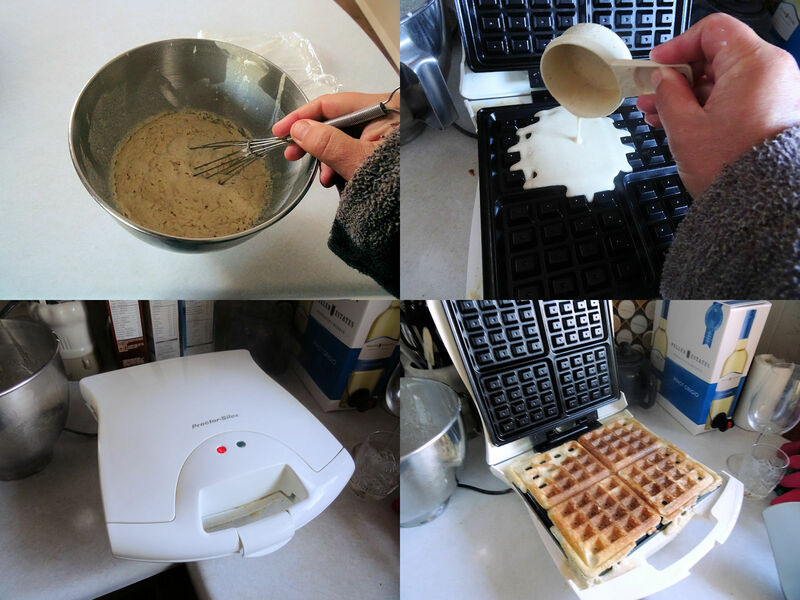 Your waffle iron could be different. You can keep the waffles warm in a 200 F (93 C) oven under a towel until ready to serve. Left over waffles are great heated in a toaster. These are one of my favourite waffles. They have a great creamy centre with a crisp surface. However, they do have a taste that is a bit bready due to the yeast. I love it but you should be aware of it. Of course, I love being able to have my batter made the day before. I am not a morning person! Put the milk and butter in a microwave safe container and heat until quite warm, 120 - 130 F (50 - 55 C). Set aside. Mix the flours, yeast and salt in a large bowl. Beat the eggs, maple syrup and vanilla together. Stir the milk mixture into the dry ingredients until combined. Add the egg mixture and stir into a smooth batter. Cover with a tea towel and let sit for 20 minutes. Scrape the sides of the bowl and cover with plastic wrap. Put the batter in the fridge for 12 to 24 hours. When ready to cook, stir the batter and cook per the instructions of your waffle iron. 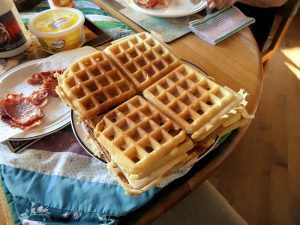 Waffles are better right off the iron but can be kept warm in a 200 F (93 C) oven under a towel. Left over waffles can be toasted and served.